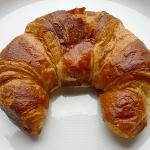 Although croissants are considered as French speciality, they have got Austrian origin. The story of croissants sounds more like a tale full of adventures. It begins in 1683 during the siege of Vienna by the Ottoman Empire. The Turks made several attempts to enter Vienna, but they were unsuccessful. They decided to dig an underground tunnel, but Vienna's bakers, who worked in the basement storerooms, heard the noise of digging and alerted the army. The Turks didn't succeed that time and the bakers of Vienna were given high honors for saving the city. Bakers made pastry in the shape of crescent moon, that is the symbol of the Turkish Empire, to celebrate the victory. This pastry became traditional for breakfast in Vienna. Croissants were brought to France by August Zang, and Marie Antoinette adored them. She introduced the croissants to France and French bakers perfected the recipe of this pastry. Traditional breakfast croissant were with frangipane or chocolate filling and were served with jam and butter. However in the early 1970s croissants became so popular, that they substituted sandwiches and evolved from their traditional two fillings into many savory and sweet variations.